The school holidays are always an excellent time to go on a much needed family vacation. Not only will your children have a blast exploring a new environment but you will also get to bond as a family. The memories you make during a family vacation will definitely be something you and your kids will cherish forever. If you are looking for great school holiday ideas, we’ve got you covered. Here we list down some of the most popular child friendly destinations and resorts in Asia that your kids will absolutely enjoy. According to TripAdvisor, Bali was the most searched destination of Singaporeans in the first quarter of 2016. It is not hard to see why Bali made it to the top of the list. Aside from the wonderful cuisine and the stunning beaches, Bali is home to a lot of great resort accommodations that will make your family trip an enjoyable experience. Often given a 4.5 star rating is the InterContinental Bali Resort. It is a luxury resort located in the Jimbaran Bay. Apart from the beautiful beach front and pool facilities, the hotel also boasts a dedicated childcare facility called Planet Trekkers perfect for your little ones. With indoor and outdoor activities to keep them entertained for days, it is the perfect beach resort for your children. Travel Advice: Bali may be a popular tourist destination but safety is still a concern for most travellers. Make sure you are protected with the best annual travel insurance in Singapore before booking your tickets. Whether or not you’re a fan of South Korean dramas or K-Pop, Seoul is a first class Asian city you shouldn’t miss. It is an excellent family friendly destination because of the abundance of attractions in the city. Lotte Hotel World is one of the most renowned family hotels in the South Korea. It is located inside the world’s largest indoor theme park, Lotte World. Averaging a four star rating in websites like Expedia and TripAdvisor, the hotel features character rooms ideal for those with little kids. They also offer themed packages that include access to nearby attractions and great programmes geared towards children. Travel Advice: Seoul is a fairly safe city. However, avoid any travel inconveniences by getting family travel insurance. Hong Kong is a great city to visit with the whole family. 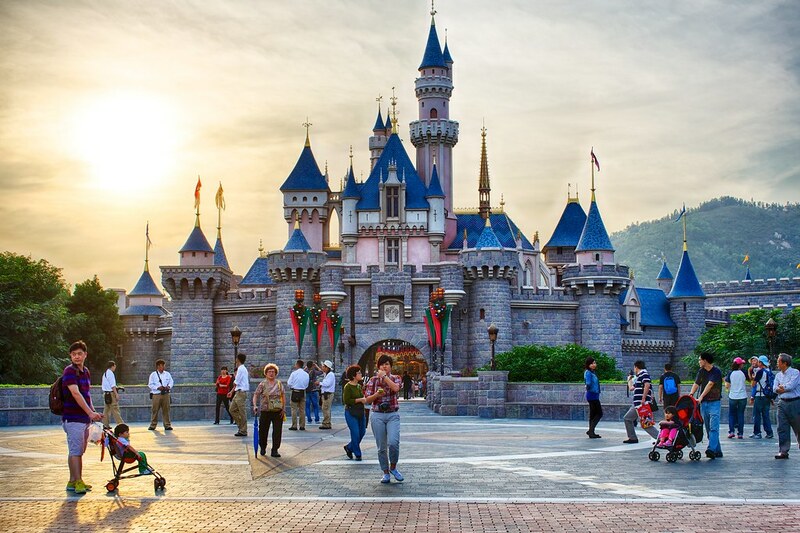 With major attractions like Ocean Park and Hong Kong Disneyland, kids and adults will surely enjoy the city. If you plan to go to Disneyland, where better to stay than in the theme park’s own hotel. The Hong Kong Disneyland Hotel is not only located close to the theme park but it is also a great family resort in the city. The resort hotel is tailored to kids and the kids at heart with themed rooms as well as indoor and outdoor activities for the whole family. Staying in the hotel will definitely make your stay in Hong Kong that much more enjoyable. Travel Advice: Although Hong Kong is one of the safest cities in Asia, keep your family prepared for any eventuality with travel insurance. Before any family trip, make sure you plan in advance and purchase group travel insurance before your trip to get the latest promotions. All of the accommodations mentioned above have been rated highly in top hotel aggregator websites like Agoda, TripAdvisor, and Expedia. They all have features that are perfect for families such as connecting rooms, childcare facilities, and activities for children that will make your stay comfortable and enjoyable. Proximity to family attractions, security, as well as accessibility are also taken into consideration when choosing the child friendly resorts and destinations. Travel smart by making use of the latest travel insurance promotions. Read about how you can conveniently buy travel insurance online. Choose the plan you want. Pay the way you want. You are insured! Visit DirectAsia to get a travel insurance quote now!